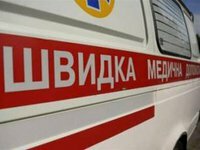 A concrete slab has collapsed in an unfinished two-storey building in the town of Nizhyn, Chernihiv region, killing three children aged from 12 to 14 years, the press office of the State Emergency Service of Ukraine reported on Friday. According to the report, the service received information about the incident at 16:20. "A floor slab collapsed under unknown circumstances in an unfinished two-storey building on Borznianska Street, killing three children born in 2004 and 2006," reads the report.